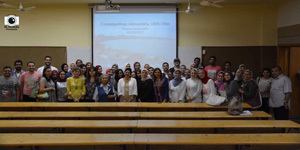 The faculty of Languages and Translation held a symposium on ” Cosmopolitan Alexandria:1805-1961″ by Prof. Sahar Hamouda on Tuesday 10/10/2017. The following themes were discussed during the symposium: the history of Alexandria City, the different communities that were living in old Alexandria and the origins of the streets names. Prof. Sahar Hamouda held many positions, some of which were the Former Dean of the faculty of Languages and Translation– Pharos University, the Former Head of the English Language Department- Alexandria University and the Former Director of Alexandria and Mediterranean Research Center at Bibliotheca Alexandrina. The symposium was held under the supervision of Prof. Leyla Kamel, the Dean of the faculty of Languages and Translation and coordinated by Mrs. Rania Bassiouny, the faculty’s Student Activities Leader.